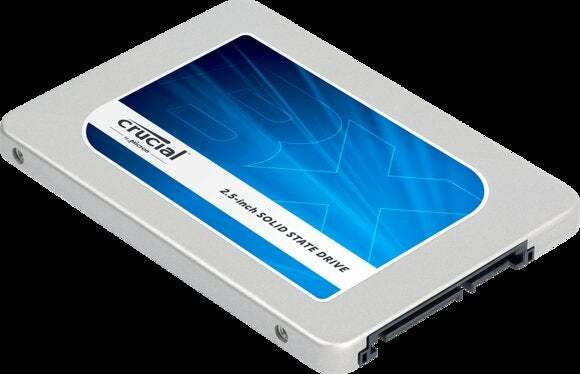 Crucial’s new BX200 is the company’s first TLC (triple-level cell/3-bit) NAND drive, and I hope it’s the last. The BX200 is difficult to recommend because while it performs very well most of the time, it rolls over and plays dead (on the SSD performance scale) when you write a lot of data to it. 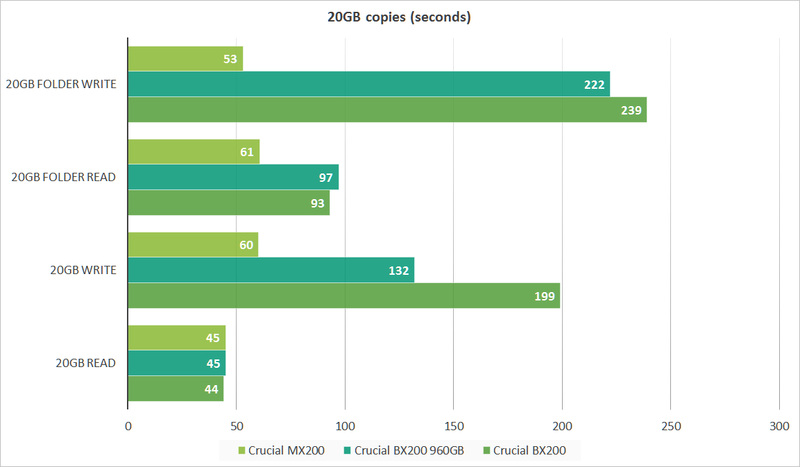 The BX200’s sustained write performance is even worse than that of the OCZ Trion and Toshiba's Q300, two drives I’ve already warned users about. At least the BX200 is priced accordingly—the 960GB version retails for a mere $299, or what those other two drives may some day be discounted to. Crucial has also apparently provided resellers enough margin that you should see the price drop lower than that. The BX200 is actually two drives in one: a very small and fast one that uses DRAM and SLC (single-level cell) memory, and another much larger and slower drive using TLC. In the BX200’s case, that TLC can only write data to its cells at about 80MBps. No, that’s not a typo. But because of that small cache drive, the BX200 acts just like a high-end SSD most of the time. We tested two versions of the BX200: the 960GB with 12GB of cache and the 480GB with 6GB of cache. The 240GB version has only 3GB. Below you can see 20GB file copies for the 480GB and 960GB versions drop off right at, you guessed it, the 6GB and 12GB marks. Write performance consistently drops off when the cache is full. At the 6GB mark for the 480GB BX200 and at the 12GB mark for the 960GB version. As you’ll see below, everything looks hunky-dory in the artificial benchmark AS SSD for the 960GB version because the 10GB tests fit will within its 12GB cache. Not so with the 480GB version, and you can expect even worse sequential write numbers out of the 240GB version. Even the 960’s 12GB of cache is not large enough to mask slow TLC performance in our 20GB copy tests, as seen below. Maybe you’re asking “When exactly am I going to be copying 3GB, 6GB, or 12GB?” Not often, but it’s not fun when you do. So the question remains: what are you willing to give up to save a modest amount of cash? The Crucial MX200 MLC drive shown in the comparisons above costs about $320 on the street, or roughly $20 more than the non-discounted BX200. Sandisk’s MLC-based 960GB Extreme II was available for under $300. In addition to being up front with me concerning the BX200’s performance (once I asked about it), Crucial also plays nice with users, bundling a version of Acronis’s True Image HD for copying your data onto the BX200. The drive itself, which is only 7mm thick and very light is also quite power-miserly. If you’re a power user, don’t even consider the BX200. Or the OCZ Trion, or the Toshiba Q300. Even if your needs are simple, you’ll be happier in the long run (actually when you install the operating system in half the time) with an MLC drive. Skip lunch a couple of days. It’ll be worth it. I promise. One caveat: the SSD market is currently in flux so it would probably behoove you to hunker down until Black Friday and see how it shakes out. If TLC drives wind up half the price, that’s a different story. 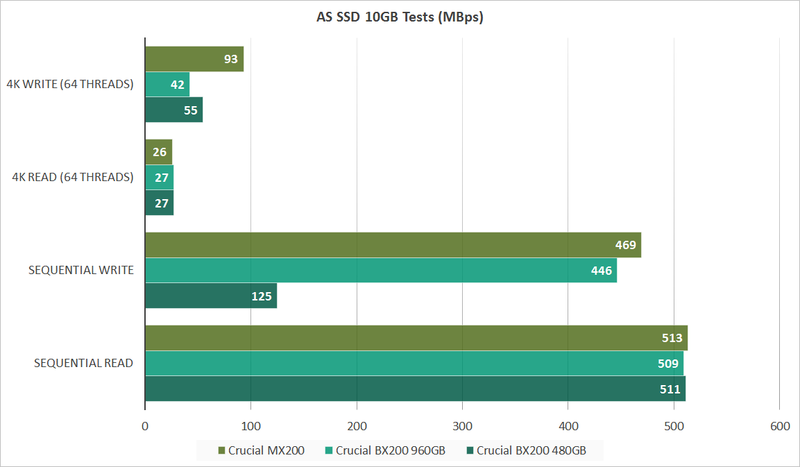 Though it's extremely affordable, the BX200 suffers the worst sustained write performance of any SSD we've ever tested. That said, day to day performance is quite good. But unless the price drops significantly, you'll get better overall bang for your buck with the company's MX200.